An easy way to reduce the possibility of a deer damaging your garden is by planting deer resistant plants and vines. Many vines, such as the ever-lovely jasmine varieties, are not a favorite snack of the deer. Their climbing growth habit and bright blooms light up the garden and diminish the likelihood of deer wrecking your landscape. By choosing vines deer prefer not to eat, you greatly reduce the chance of inviting them into the garden. An evergreen to semi-evergreen, crossvine (Bignonia capreolata) is a deer-resistant climbing plant with a rapid growth rate and medium texture. The name crossvine, comes from the cross pattern in the stem’s pith. Growing 30 to 50 feet tall, crossvines have twining tendrils that easily adhere to surfaces like garden walls and fences. The bright orange to red trumpet-shaped flowers on the cross vine grow 2 inches wide. The fragrant crossvine blooms in mid-spring to last into the summer. Versatile, crossvines tolerate a wide range of growing conditions. A hummingbird attractant, crossvines have deep green leaves that turn purple in the winter. Crossvines require full sun to light shade and well-drained, nutrient-rich soil to thrive. The USDA Hardiness Zone for planting is 6 to 9. Coral honeysuckle (Lonicera sempervirens) is a summer-blooming climber that grows 10 to 15 feet tall. 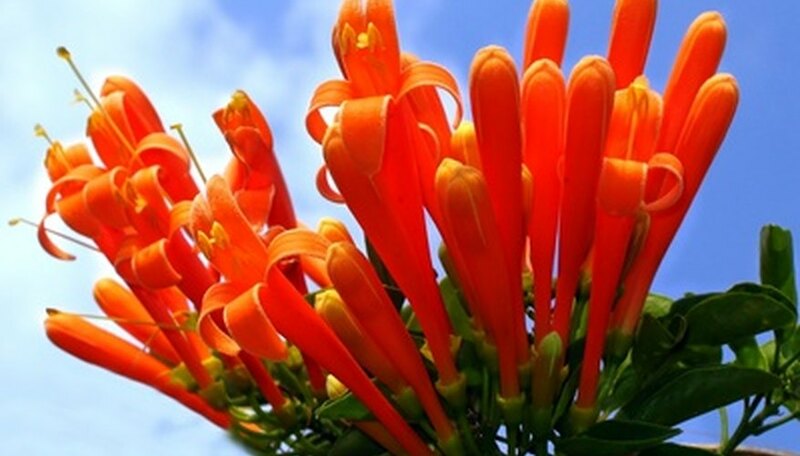 A hummingbird attractant, the showy flowers on coral honeysuckle are scarlet to orange with a yellow center. Twining in nature, the tubular-shaped blooms on the coral honeysuckle contrast with the bright green foliage. In fall, coral honeysuckle have bright red fruit that lights up the vine to create a showy landscape display. Coral honeysuckle requires full sun to partial shade and a dry to medium moisture content. The zone for planting is 4 to 9. Confederate jasmine (Trachelospermum jasminoides) is an evergreen vine with a rapid growth rate and medium texture. Deer-resistant, confederate jasmine grows 10 to 15 feet tall, making for an ideal vine to grow over an arbor or outdoor pergola. Confederate jasmine has a twining climbing method with steadfast roots. In spring, the white, fragrant flowers emerge on confederate jasmine to create an aromatic scent to the garden. Drought-, heat- and wind-tolerant, the leaves on the confederate jasmine are outlined in white to create the variegated foliage. Confederate jasmine prefers full sun to partial shade. The zone for planting is 8 to 10.